My mother and I own property in Northeastern Washington state. USDA Zone 5b and situated at about 3200 feet in elevation. Trying to figure out a few things so we can make progress on the build this Spring/Summer. Winter temps can be as low as -20F and summer temps have reached 109F on occasion. Property is on the grid but it is a vulnerable grid which has been taken offline for several days at a time during the summer for maintainence. It’s also been down due to major storms, wildfires, etc. There is a small, dry hunting cabin on the property but we’ll be building something more substantial for full-time occupancy. Geo-thermal (with appropriate insulation) seems like a good option to help keep inside temperatures within liveable ranges should the grid fail. That said, I’m wondering how deep we’ll need to dig and if there’s a way to figure out how deep our actual bedrock is. The properties above and below us have very little topsoil ( like less than 12”) but our property seems to have acted as a catchment for a lot of the soil from above us. I know I’ve been able to dig several 2 foot holes in the past and the company that installed our septic system didn’t have any issues. Is there an online resource that has average earth temperatures at various latitudes and depths? Any low tech tricks for determining how far down your bedrock is? What’s the cheapest way to do a geothermal system? I really liked the geothermal system the Raney’s did on Homestead Rescue but not sure how well that design really performs. We’ll want to have a way to power any fans with solar or battery due to the previously mentioned grid issues. Hi Diana, one way to measure temps down deep is to get a post hole auger like This. You can extend the handle to dig pretty deep. Last winter I kicked aside the snow and checked my ground temps. Every foot or so I just used a probe thermometer to measure the dirt I was bringing up. The temps down in the geothermal range are probably pretty close to your average year-round temperature. I haven't seen the show you're talking about Is it geothermal using air or liquid as the heat transfer? 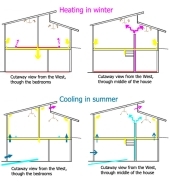 I would suspect that with good passive solar design you could get by without needing too much heat in the winter.